Very nice. I especially liked the animated image of the downloader at work. Also kind of interested in the program that disables the monitor on the author's website... will try to come back to that. Added POST data field to advanced options in Add URL(s) window. Added option to download drag and drop URL(s) immediately. Added the ability to restart downloads. Added the ability to remove and delete downloads at the same time. Added Spanish string translations (thanks to c-sanchez). Added Search window to search filenames and URLs. 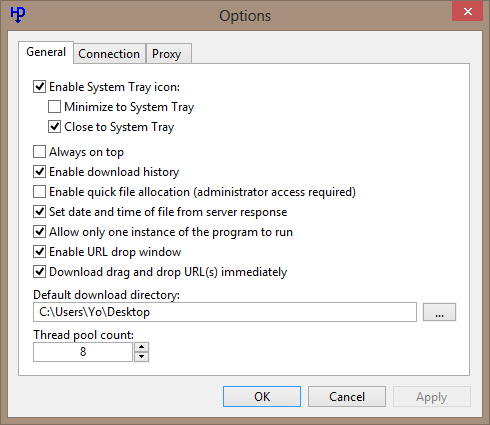 URL drop window can toggle Always On Top from its context menu or by middle clicking window. Improved support for browser extensions. Dynamically loaded SetFileInformationByHandle to hopefully get Windows XP working. This is an immense release which brings huge enhancements. Now browser integration is perfect (there are new releases of Chromium and Firefox extensions) since HTTP Downloader can intercept downloads from browsers. Downloads can be started automatically without confirmation. I have tested only the Chromium extension and it worked perfectly. The program should work under Windows XP (see this thread and especially this post, confirmation that HTTP Downloader works on Windows XP would be welcome. Spanish language users have a look at this thread- Spanish language file can be found here. Since the program has changed a lot I took new screen-shots. Within 3 releases in a month time HTTP Downloader has improved incredibly, I would like to thank once again the developer- Eric Kutcher for his incredible work. I added HTTP Downloader to the database. Downloaded the program, installed the FF extension, set: override the browser's download manager and bumped into a problem straight away. I have never said that HTTP Downloader can download video. Before downloading and using the program it you might have read the description on program website if the one in the the database is not enough clear for you. HTTP Downloader CANNOT download video! If it could I would have mentioned that explicitly. Fixed incorrect values for remaining and elapsed time columns. Better handling of improper range responses. For video downloads look at this post by the developer. I quickly tested HTTP Downloader versions 1.0.0.9 and 1.0.1.0, and can confirm that both versions work in XP. Lot's of improvements with these latest versions as you have outlined, including the addition of a drop window and portable mode using a file, which are very useful. HTTP Downloader is extremely fast and lightweight, with a small footprint using very little resources. It's probably the fastest launching downloader I've seen yet, pretty much instantaneous on my system. Good work with the developer in getting these improvements implemented. 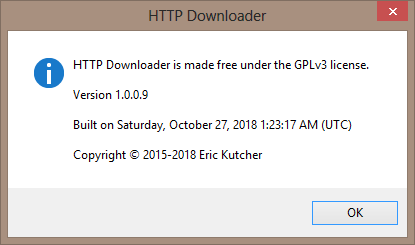 Thank you for testing HTTP Downloader and for confirming that it runs under Windows XP. The developer has done amazing work. I am glad that Windows XP users can take advantage of this slim, light and fast download manager. Fixed Completed downloads not being able to be restarted. Got program's directory from module path so "portable" file is detected when using PATH environment variable. Swapped Rename and Delete menu items. Added option to play sound when all downloads finish. Cookies in download info will be updated if found. Extensions can optionally pass Referer and User-Agent strings to program. Chromium and Firefox extensions has also been updated, both are at version 1.0.0.3. Added option to show system tray notification when all downloads finish. The program is very stable, mature enough and it integrates perfectly with Chromium-based browsers (I cannot speak of Firefox integration because Quantum versions are banned on my machine). All thumbs up from me as well! I have downloaded software and I'll give my review after testing. 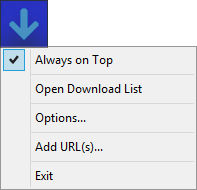 Double clicking on a download will open its folder location. System Tray notification shows counts of finished downloads. Revamped command-line arguments to match settings in Add URL(s) window. Added option to prevent system standby while downloads are active. Fixed detection of multiple filename attachments. Allowed open file handles to be shared for reading. With Free Download Manager spewing time and again 'Can't connect to the server' error HTTP Downloader is a godsend for me. --base-directory [path] - The directory where the program's settings and history are saved. --portable - Run the program in portable mode and saves its settings and history to the same directory as its executable. You can optionally create an extensionless file named "portable" in the same directory as the executable. --url - A URL to download. --output-directory [path] - The directory in which to save the downloads. --parts [1-100] - Sets the number of parts in which a download will be split. --username - The username for a request that requires authentication. --password - The password for a request that requires authentication. --cookie-string - Include a cookie string with the connection request. --header-field - Include a header field (name and value) with the connection request. --post-data - Include POST data (URL encoded) with the request. The request will be made as a POST request instead of a GET request. --simulate - Download URL(s) without saving them to the disk. 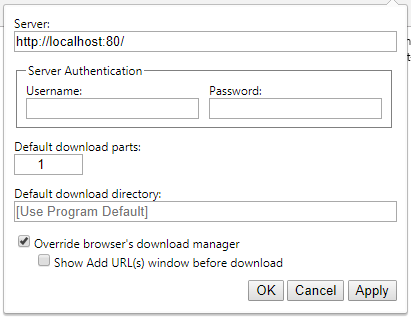 --immediate - Begin downloading the URL(s) without showing the Add URL(s) window. --url-list [path] - A text file with a list of URL(s) to download.